This is our Wildcrafted Myrrh Steam Distilled Essential Oil. Herbal Folk Traditional uses for Myrrh include arthritis, asthma, common cold, congestion, coughing, gingivitis, hemorrhoids, menstrual imbalances, sore throat, weak teeth and gums, ulcers of the mouth. 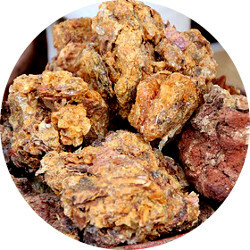 Myrrh as a resinoid is a dark reddish-brown thick mass with a warm, rich, spicy balsamic scent. As an essential oil it is pale yellow to amber in color with a warm, sweet, slightly spicy scent. Myrrh blends well with Benzoin, Black Pepper, Cardamom, Cedarwood, Chamomile, Champaca, Cinnamon, Clove, Cypress, Elemi, Frankincense, Galbanum, Geranium, Ginger, Juniper, Lavandin, Lavender, Lemon, Litsea Cubeba, Mandarin, Mint, Myrtle, Niaouli, Oakmoss, Opopanax, Patchouli, Peppermint, Petitgrain Mandarin, Pine, Sandalwood, Spearmint, Spikenard, Spices, Thyme and Tuberose. Myrrh oil is used in small amounts in heavy-floral type perfumes, heavy-Oriental type and woody-balsamic bases. It is excellent in high class forest and moss notes modified with cypress oil, juniper berry oil, mandarin and petitgrain oil. Myrrh Essential Oil is used in cosmetics, fragrance, mouthwash, perfumes, soap and toothpaste. Myrrh Essential Oil has the following actions: anti-catarrhal, anti-inflammatory, antimicrobial, antiseptic, astringent, balsamic, carminative, cicatrisant, digestive stimulant, emmenagogue, expectorant, fungicidal, pulmonary stimulant, revitalizing, sedative, stomachic, tonic, uterine and vulnerary.